These were so good, hot and crispy and pungent with rosemary -- perfect on their own but especially alongside roasted pork. As usual, I lightened the recipe a tad -- the fat wasn't missed and the calorie benefit is big. Many thanks to my ever-helpful cousin Lynda for teaching the simple knack of roasted potatoes, something I've never before had much luck with. Preheat oven to 400F or 450F. Prep the potatoes and onion. 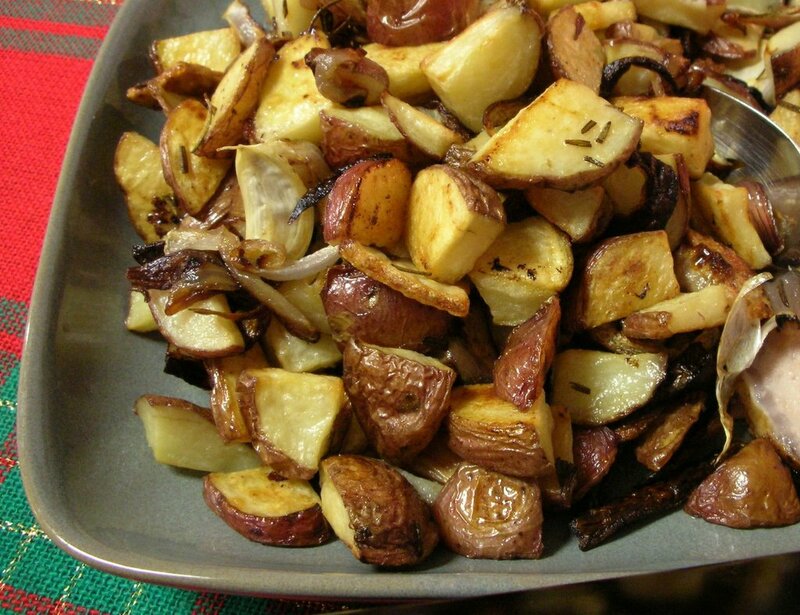 Toss the potatoes and onion very well, coating completely, with the butter/olive oil. Add the garlic and rosemary. Arrange on the rimmed baking sheet in a single layer. If you like, squeeze the garlic clovers out of their skins. Season with salt and pepper, serve and ENJOY!